Home » Blog » New Year! New Pool! People who choose to make a New Year’s resolution are 10 times as likely to keep them over those who pursue improvement in another way. While resolving to improve your life, you can also resolve to improve your swimming pool and spa. Swimming pools and spas can offer lots of benefits both physically and mentally. Swimming can help improve your flexibility, strength, circulation and lung capacity. When you exercise in water, 90% of your body is buoyant, which takes the stress off your joints, according to the U.S. Water Fitness Association. Also, water can bring a sense of calm, clarity and relaxation. People love to spend their down time in and on the water, including at the beach, pool, or relaxing in a bath. This can help foster better mental health and positive attitudes. Here are some ways you can improve your swimming pool and ultimately yourself! Backyard automation systems can help manage the operation of your pool and spa. The control can also be synced and controlled by your smartphone. When using this system, pool owners can utilize pre-configured programming and icon-based touchscreens. This will allow you to schedule when your system, heater, lighting and more turns on/off. This way you can ensure your pool and/or spa is nice and toasty for your evening dip when you return home from work. Automation will save you both time and money. 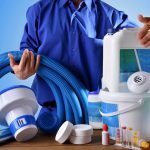 Some people like to have a pool company take care of their pool and avoid all the worries that comes with maintenance. Others like to take a hands on approach to making sure there backyard oasis is truly theirs. Either way a homeowner training session can teach the basic ins and outs of maintaining your pool and spa. This can include the labeling of your system and a customized manual developed and tailored for your pool and spa. Making sure that everyone can safely enjoy your swimming pool and spa is a must. Take the time before the season starts to make sure everyone knows how to swim. Another thing to consider is enrolling in CPR and First Aid for the entire family. It’s great to have for a multitude of reasons, beside the backyard. You can contact your local American Red Cross of YMCA for classes in your area. There’s a multitude of items you can get to have the swimming pool and spa of your dreams. So, the New Year would be a great to improve your swimming pool and lead to a happier, calmer, and more relaxing you for 2018.